ASP welcomed participants to the first of the monthly New Member and Volunteer Orientation (ASP NMVO) at the Autism Society Philippines National Headquarters last 12 March 2016. ASP National President Mona Magno-Veluz presided over the orientation with assistance from ASP National Trustee Peng So, ASP UP-CAMP President Jeng Rodriguez and ASP Program Manager Cenin Faderagao. The event opened with the Autism Advocate’s Prayer and the ASP version of the Philippine National anthem. The 28 participants introduced themselves and explained why there were there. Half were parents eager to understand what the organization can do for their families. The other half were educators, psychologists and professionals eager to be part of ASP’s journey towards and Autism-OK Philippines. Ms. Mona proceeded to give an overview of what autism is, to expound the nuances of language and labels around autism and to share the mission and programs of ASP and its activities over the next few months. 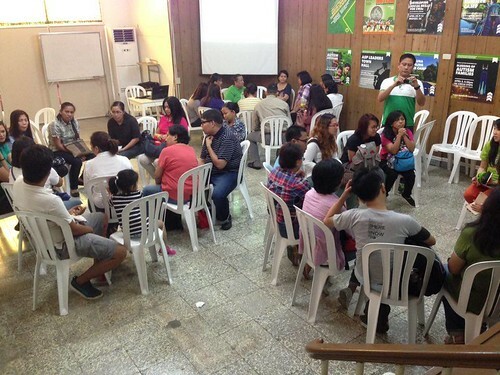 The large group split into the parent and the volunteer circle where the participants continued to discuss the next steps in how they want to be involved in the advocacy. Moving forward, ASP will conduct an orientation for the growing number of ASP members and volunteers monthly. Please monitor our Facebook account for announcements.